There's something about sparkly nails that always makes me feel festive and I definitely find myself reaching for the glitter shades in December more than any other month of the year! 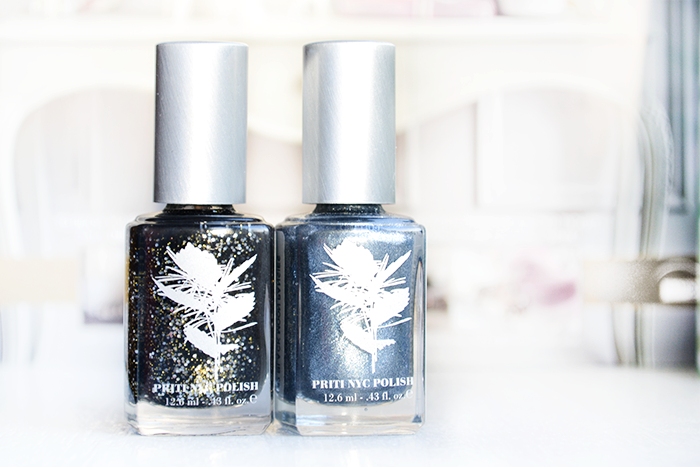 I'd only tried one Priti NYC nail polish before, so was excited to have the chance to try out a couple of shades from their metallics range for the party season! Pewter Veil* is the first shade I picked out, which is a dark greyish-blue with a metallic finish. It was pretty difficult to capture on camera with the dim winter light, but it has a lot more shimmer to it than you can see in the photo! It has quite a sheer formula, taking 2-3 coats to be fully opaque, but unlike some other metallic polishes I've tried it hardly leaves behind any visible brush streaks. It's quite a unique shade in my collection and I think it's perfect for giving that stylish, slightly edgy look! Black Moon Pansies* has very quickly become a favourite of mine and I absolutely love the name. It's a charcoal black polish with gold glitter, silver sparkles and a super glossy finish. It has a kind of jelly-like formula which I find really easy to apply and it takes 2-3 coats for me to get the perfect coverage and finish. If you've used glitter polish before, you'll know it's more difficult to remove than your standard colours, but you just need to soak the nail with remover for a couple of minutes and it'll come right off! I think it's totally worth the extra effort for the party season since it looks so good on the nails and I won't be able to resist wearing this constantly over the next few weeks! If you fancy treating yourself to some new nail polish for the holidays, pritnyc.co.uk are offering you guys a super generous 30% discount when you use the code Naturia30 (expires 31st December). You'll have to let me know what shades you choose if you take advantage of the offer! What do you think of these metallics for the party season? Have you tried Priti NYC before? These are so pretty! I've never heard of Priti NYC but I think these glittery shades would be so great for New Years! Perfect for a special occasion where you want to shine! I love Black Moon Pansies and am definitely feeling inspired by the color selection from Priti NYC. I have yet to try this brand, but have heard it mentioned many times before.